Thanks to everyone who showed their support for the charity event at Richmond Comix last Saturday. We had a strong turnout for Magic with quite a few tables for Sealed Magic 2015 and seven pods of four for Commander. They raised a good amount of money for a great cause and lots of people had fun, so it was all good. I decided to play my Prossh, Skyraider of Kher deck in the hopes that I'd be able to quickly kill whoever at the table was looking to combo kill the fastest. Unfortunately, said combo player hit my karoo land with an Acidic Slime to set me back two turns, and with mana-ramp and Chord of Calling he set up Deadeye Navigator paired with Palinchron to generate infinite mana. I had a Slaughter to try and break up the combo when Deadeye was briefly unpaired on Soulbond, but he had the counterspell to stop it. 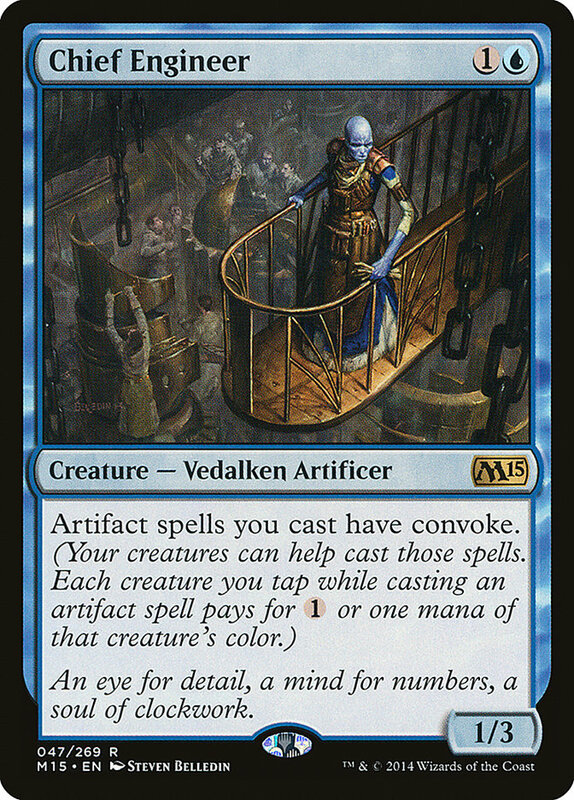 Infinite mana, then blinking Acidic Slime in and out to kill all our non-creature permanents, and then cast Prime Speaker Zegana to draw into Venser, Shaper Savant and then blink that dude to bounce all our creatures back to our hand. It was particularly disheartening because we didn't all just die on the spot; instead we sat helpless for a few turns while he sent attacks around the table to chip away at our life totals. 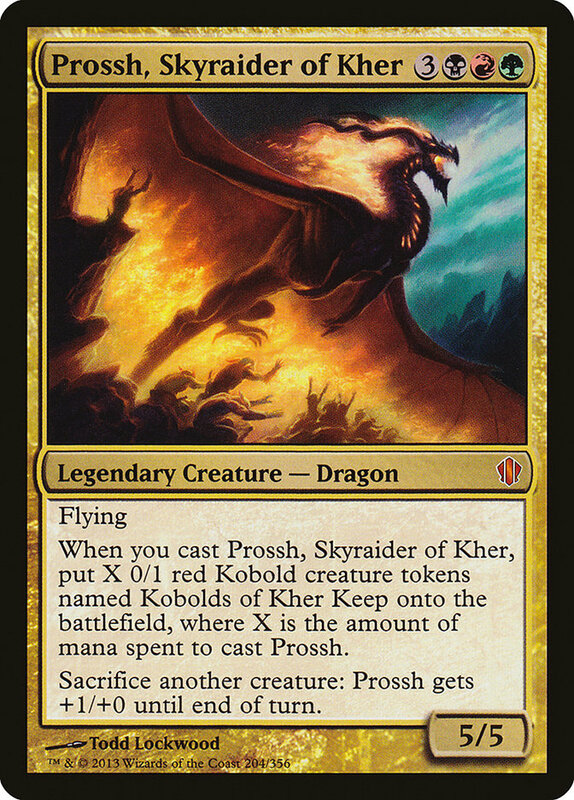 If you're curious about my Prossh, Skyraider of Kher deck you can find it in my ebook The Complete Commander! As I was scanning through the legends from Magic 2015 and deciding which one was next for my Commander treatment, it occurred to me I may have found a solution to my problem. Take a look at this gorgeous gal! 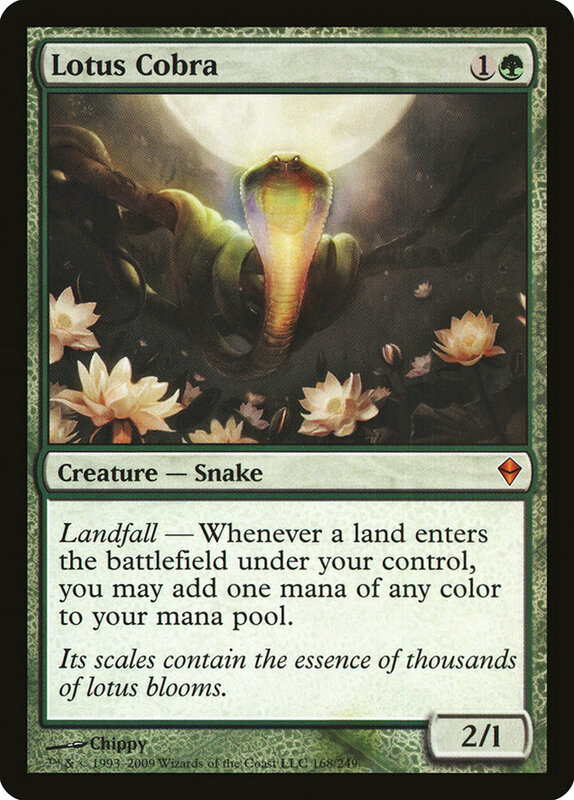 I've always thought that Polymorph and other similar cards were cute, but to be effective in the past they've needed to have one or two giant, game-winning monsters in the deck alongside a bunch of spells that make creature tokens with a hefty dose of "protect your backside" spells to keep you from dying before you get to fire off the combo. This sort of deck is going to be mostly just spells, and that's not something I've ever been overly fond of playing. I tend to like to have at least a fair amount of permanents - preferably more than just lands - on the table doing stuff for me turn after turn. 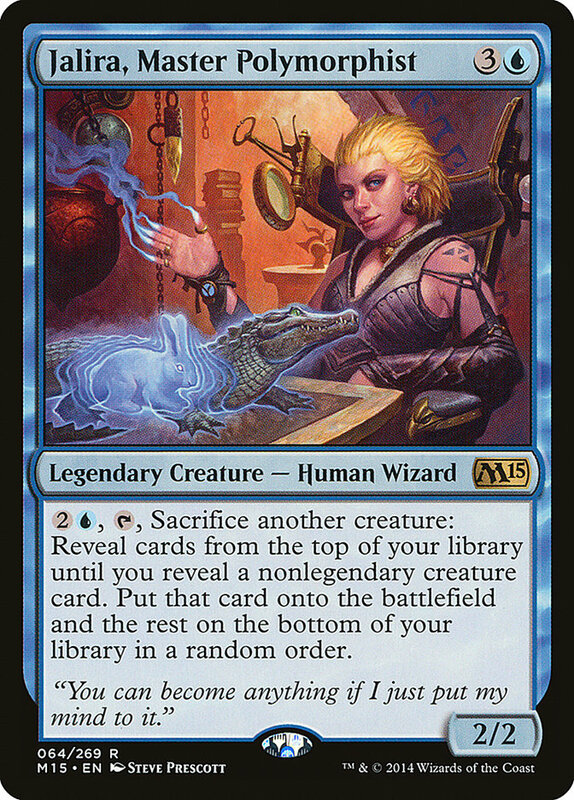 Jalira, Master Polymorphist offers the same punch as Polymorph but with a pretty sweet loophole to let you play creatures outside of the big guns you're hoping to transform sacrificial lambs into. And it's something you can do multiple times… and since she's a legend and can be your commander, you will generally have access to her whenever you want it. I got quite excited thinking about the possibilities! First order of business was checking out all the legends we had access to for our mono blue deck. Turns out there are quite a few of them! One thing I noticed was that a lot of them were wizards - including our Commander Jalira, Master Polymorphist herself! 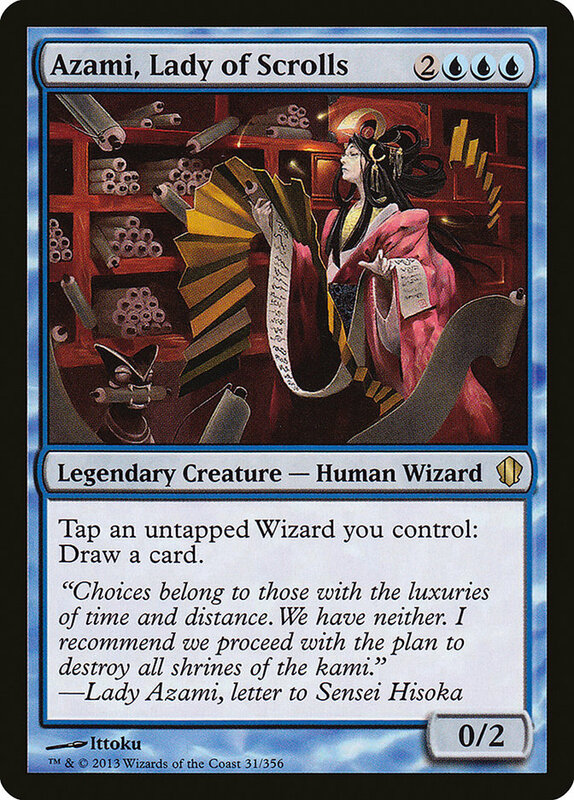 I didn't see too many wizard synergies I could employ without using non-legendary creatures, but figured Riptide Laboratory (with Venser, Shaper Savant) and Azami, Lady of Scrolls (with all the wizards) was enough to be happy with. It's a shame the wizard equipment Diviner's Wand is so clunky, though if I were running a version of this deck without so many counterspells I'd put it in strictly for flavor reasons. I really like that Heroes' Podium fits right in here, potentially boosting the normally frail and fragile legendary wizards into red zone-brawling beasts! The nice thing about being able to play a lot of legendary creatures in your Jalira deck is that you should have plenty of potential Polymorph targets for her ability. Still, I figure sometimes the board will have been swept one too many times and the legend or two you have on the board you'll want to keep on the board, so I've added in a lot of the cards that either turn into creatures or make token creatures that you'd expect in a Polymorph deck. Nim Deathmantle is a pretty sweet way to cheat the sacrifice if you have enough mana available, and I like that Desertion, Empress Galina, and Spelljack can potentially steal a creature from your opponent that you can sacrifice to Jalira. 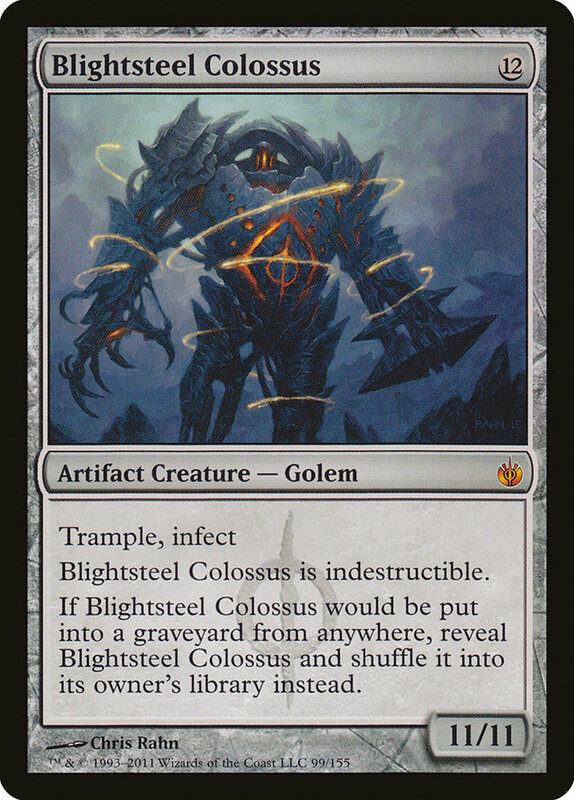 Obviously the best high-cost, game-winning, non-legendary blue or artifact creature to Polymorph something into is Blightsteel Colossus. 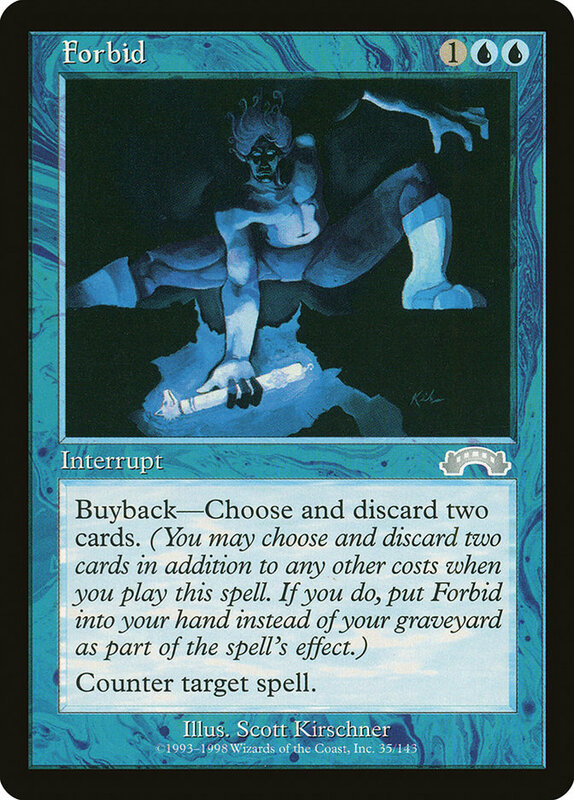 My original plan was just to have Blightsteel and be done… but it occurred to me that just having one single Polymorph target could be quite dangerous in a format where exile effects are quite often played, and people will even play stuff like Bribery-I'm pretty sure once you reveal that you're a Jalira, Master Polymorphist deck, any Bribery is going to target you. Homeward Path was a given, but I should probably have some backup, and after some searching and thinking about the choices, I settled on Scourge of Fleets and Stormtide Leviathan. Both conveniently shut down a treacherous Blightsteel Colossus under someone else's control and offer big-time game-altering effects. I'm not entirely sure these three are the best choices, but they're what I'm going with in my first draft. I figured a Master Polymorphist deck ought to be more than a one-trick pony, and so I added some of these cards to the mix both for flavor and for utility. Sometimes a creature is much more threatening than the 3/3 Ape or Frog Lizard, or the 1/1 Frogs they should be with some coaxing. 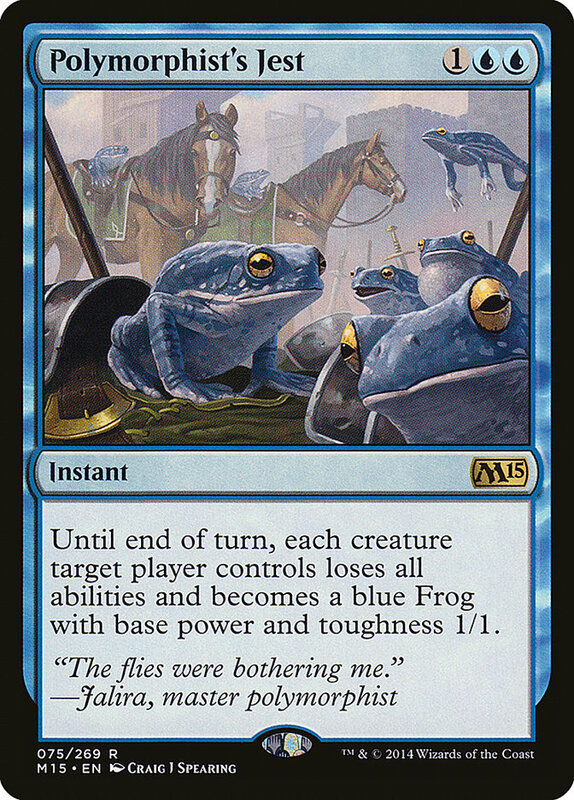 And Polymorphist's Jest is just a wonderful ambush spell when you're playing small creatures that happen to be bigger than 1/1s… I just really can't wait for someone to slam down Avacyn, Angel of Hope, and I hit them with Polymorphist's Jest and then sling an Acorn Catapult at Frog-Avacyn and kill her off. 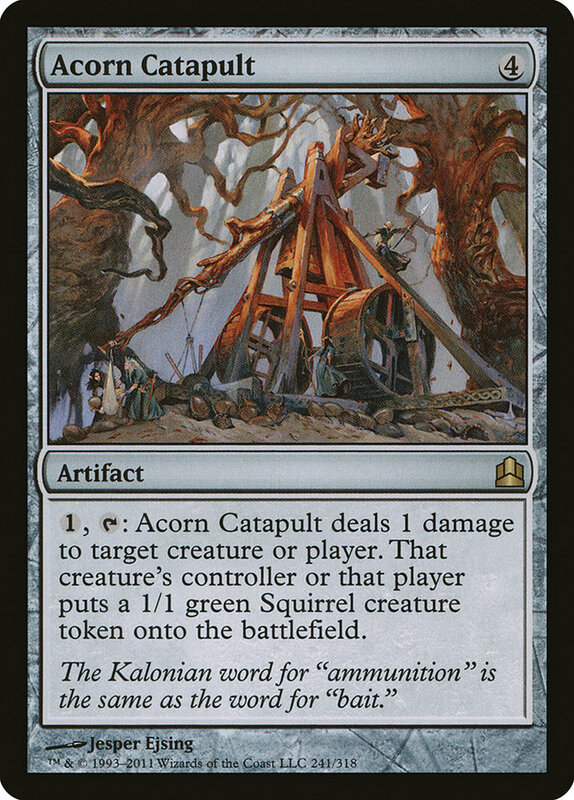 Sure, have a 1/1 squirrel for your trouble! Here's the part that's odd for me. While I will on occasion toss a few counterspells into my Commander decks that have blue (usually going for the feel-good counterspells like Arcane Denial and Dream Fracture), never have I gone this deep into permission. I've even got a Forbid in here, which steps way over my personal fun line, but I had to remember what I was building this deck for. It's not what I'm going to bring out when sitting down to a casual, fun game of Commander-I have just about every other Commander deck in my arsenal for that. It's what I'm bringing out to battle the vicious decks, and some of them deserve to be put under an Ertai or Forbid lock until I clobber them with Blightsteel Colossus. I'm a little unsure of Heidar, Rimewind Master. He's a wizard with a pretty powerful ability; I like being able to force permanents back into player's hands so I can counterspell them on the way down, and he's a stone-cold token-killer. Still, I'm not sure that 27 snow-covered permanents are going to be enough to turn him on reliably? 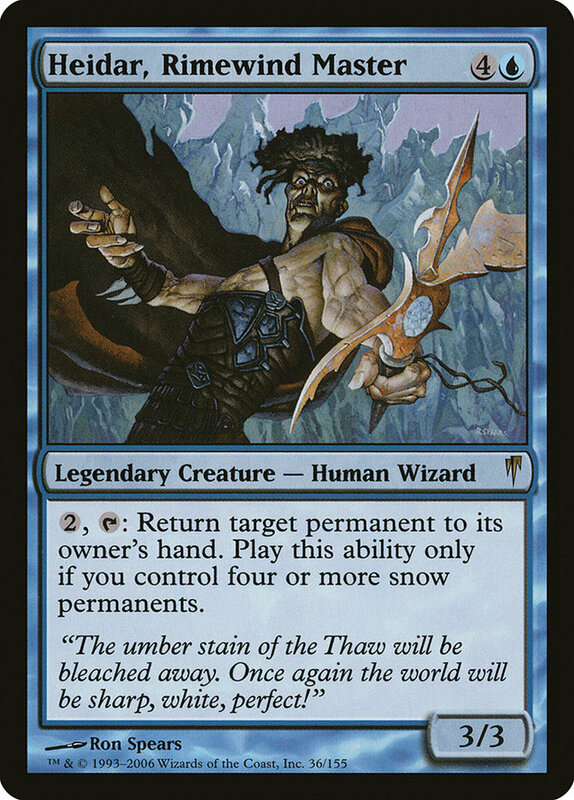 He needs four in play… I've kept the non-snow lands to a minimum to try and facilitate this, with a fair amount of cantrips and Journeyer's Kite to keep the lands hitting. I slipped Dragon Wings in here as a cool little cycler that can potentially help a ground-pounder get aggressive if I've got Stormtide Leviathan in play-how about a flying Scourge of Fleets or Blightsteel Colossus? I'm curious to hear what you all think of this walk deep down the blue side of the tracks. Even though I know the heavy permission will frustrate some players, I can only hope the "cool factor" of activating Jalira, Master Polymorphist and turning Rayne, Academy Chancellor into some massive monster and smashing face with it will show the evil combo kids how to properly throw some fun haymakers. If you liked the sweetChief Engineer deck for Standard I wrote about two weeks back be sure to check out Bruce Richard's column this week on the mothership. He took inspiration from my column, spun some other ideas past me and Brandon Isleib, and cooked up some Serious Fun. I've got an order of Magic 2015 cards that should be arriving this week, and if they get here in time I hope to run some sort of deck featuring Chief Engineer, Scuttling Doom Engine, and Trading Post at Friday Night Magic and another Standard tournament on Saturday. Fingers crossed that fun shenanigans will ensue! Around the release of Zendikar, Adrian Ferrer AKA House of Sixten, launched a Magic-themed comic strip called Lotus Cobra is Evil. The artistic style is cute anime and the humor is light and fun. I just found the strip totally adorable and addicting and eagerly awaited each new strip for its run, which lasted about a year or so. Other obligations pulled Adrian into other directions and the comic was put on hiatus- but now it's back! He promises a new strip every Wednesday as well as revamping old strips to make them more printer friendly with the goal of compiling his strips into a book. If you like theCardboard Crack Magic comic strip, check out Lotus Cobra is Evil over on House of Sixten!